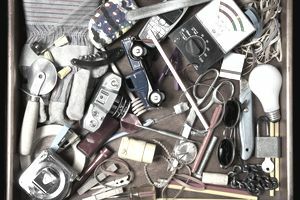 Most people have at least one drawer in their home that is full of a variety of small items that aren't really ever used. All sorts of odds and ends are tossed in there. Things you don't know what to do with because they are too good to throw away, have become obsolete or might come in handy one day. Try researching these items and look them up to see if they have value. You will be shocked to learn how much junk drawer items sell for on eBay. Along with mugs, t-shirts, and all other items, some gift cards are collectible. Even the gift cards with no monetary value! Starbucks creates limited edition and collectible cards. For example, a limited edition Starbucks Gift Card with no monetary value issued in 2009 with a San Francisco cable car on the front is worth $80. Technology has evolved, and most smartphones now have a dictation, voice memo, or audio recording feature. But some people still prefer good old-fashioned cassette tapes. These can sell for unbelievable prices on eBay. You can also find these on clearance sometimes at Walgreens or at estate and garage sales. Maybe these have fallen off your favorite blazer and were thrown in the junk drawer. Or, maybe you have a blazer hanging in your closet that is damaged or doesn't fit. Take the buttons off and sell them. People buy designer buttons and patches to either replace missing buttons or to jazz up a lesser brand blazer to masquerade as a designer piece. Crafters also make all kinds of jewelry and home decor items out of vintage or unusual looking buttons. eBay shows over 8,000 active listings for used buttons in the craft category, and over 2,500 completed listings for used buttons. Sell those buttons to crafters who will make something beautiful out of them. Remember the era of the day planner or file-o-facts? The smartphone has made these items obsolete in the mainstream, but some folks still prefer a planner they can write in. Franklin Covey was the leading brand of daytimers, but other brands are also profitable, too. Look for these leather-bound planners in the office junk section at thrift stores. You can score them for $3 or less. Although not a leather-bound planner, an eBay seller recently sold a plain journal for over $1300. It wasn't in her junk drawer, but she found it at a thrift store for $1.50. Apparently, it had been in someone's junk drawer and was donated to a thrift store, so you may have a valuable item in your own home and not even know it! Most people don't carry a pocket calculator anymore since most smartphones and mobile phones have a calculator function. However, if you have teenagers or had teenagers and now they are grown and have left home, they may have left their calculators behind. A graphing calculator is required for most high school math courses such as trigonometry, calculus, and statistics. Also, these calculators aren't cheap. Brand new calculators cost a minimum of $70 leading parents and students to seek out avenues for purchasing used calculators for a lower price. There are companies who buy used calculators on eBay and resell them on their own websites such as CalculatorSource.com. Remember that day you were so excited when you got your new iPhone or Android phone? You probably traded the old one in and shoved the charger into a drawer somewhere. Or, maybe you upgraded from a dinosaur desktop computer to a sleek new MacBook Air and no longer needed the cables, mouse, or power strip. All of these items can be sold on eBay as accessories. Otter Boxes and other brands of phone cases, wall adapters, power strips, computer cables, car chargers, and belt clips are all sellable. It doesn't matter if the cord is from an older model electronic device. In fact, those older models are the money makers. Let's say a senior citizen is using a 10-year-old Nokia phone, but the charger died. It would be is easier for him or her to buy a used charger than to have to learn how to use a brand new phone. These items are also worth money! Amazingly enough, people collect game board pieces or crafters make them into jewelry. Older dice, backgammon tokens, or checkers made of bakelite are especially valuable. Bakelite is a hard plastic-like material made in the early 20th century that is quite valuable and collectible. Items like game pieces, hairbrush handles, knife handles, hair combs and barrettes, buttons, and costume jewelry were often made from this material. Selling these types of items may seem unusual, but people actually buy used eyeglasses on eBay. Usually, the buyers are in search of a certain designer or pair of vintage glasses that they can reuse or resell. Cartier, Chrome Hearts, Burberry, Prada, and Gucci are sought after brands and can sell for hundreds of dollars in used condition. Film production companies (many in Hollywood) often come to eBay to purchase props and costumes for films. They may be looking for vintage styles of eyeglasses, like the cat eye or horned rimmed. You just never know what your own old ​eyeglasses might sell for on eBay. Along the same lines as used eyeglasses, used dentures, false teeth, and dental bridges can also sell on eBay. The most common reason a buyer would want these is for the precious metal fillings or crowns in the teeth. Dentistry has evolved quite a bit over the last 200 years. In the early 19th century, metals were used for fillings. Anything could have been used including silver, gold, tin, or copper. As dentistry evolved, amalgams (or a mixture of metals) began to be used. The older fillings and crowns have more precious metal in them, so they are more valuable. Buyers can take these to "We buy gold" places and sell them. The dentures may be used secondhand. Some people actually buy the used dentures to wear if they cannot afford to have them made. Unfortunately, a full set of dentures costs at least $2,000 and can exceed $15,000. This isn't an option for many people, so they try to make do with a used set. Take some time, dig through those junk drawers, and look up everything you find—even if you think it won't have value. You will be shocked!